Gratinada con parmesano ¡ deliciosa ! 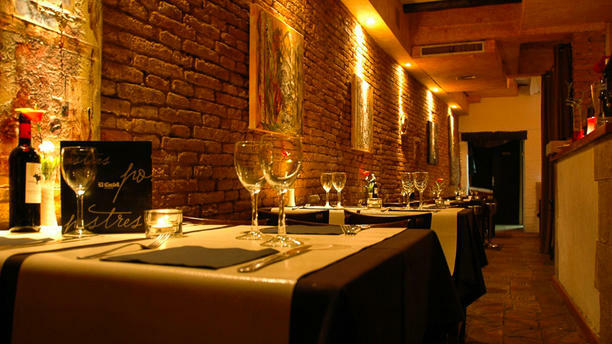 "Restaurant El Castell was made for romantic occasions. Located in a charming enclave, the old town of Sitges, this place is composed of a cozy decor and specially crafted lighting to give you privacy. The menu is Mediterranean and tasty, its creators offer dishes like the ravioli stuffed with gorgonzola and pear with Parmesan, or pistachio breaded tuna with mango and soy reduction. They also have vegetarian options and a list of delicious desserts. The Castell was made so that you feel comfortable with your partner, if you want to give them a surprise or make your meal or dinner something out of the ordinary for him or her, their staff offers itself as an accomplice in helping you carry it out. Don't forget this place when planning a romantic evening." We had the lobster menu. And while the starters were pretty decent, the main dish was really poor. By far the worse lobster I’ve ever tried. I wouldn’t recommend going with kids as well, the place is too tight and while the waiters were accommodating, it wasn’t comfortable for families, wish I knew before. A gorgeous little restaurant serving exquisite food. A cornucopia of tastes and flavours, wonderfuly presented, and thoughtful your together for your delight. Very intimate and charming restaurant, Great service, good food and generous portion. small but charming place, very good quality, very efficient and friendly waiter, I had the Cebolla soup that was delicious and the Bacala was cooked to perfection! We enjours the evening with good service, very good food. The price was okay for all those good experiences. Wonderful ambience, super friendly staff, inspiring food - don’t miss the cheesecake!